What our customers are saying about our Holiday Cottages In Anchovy To Rent. "El Oasis is a beautiful park with beautiful scenery and beautiful, some old-fashioned villa &quot;s. They offer privacy and space. There is also a nice looking pool at what was certainly tried during our stay to keep, but not filtered clean was so the water was very murky and not reliable for swimming. was also our house close to the outer wall of the park, and therefore at a busy road with a gas pump. It was right therefore to hear all day long frantic movement and music of the gas. Very pity, because we had great weather and beautiful terraces to choose to sit. optionally in the sun or in the shade later in the park at other houses heard noise or almost not at all. were the towels daily changed and were the two bathrooms and toilets cleaned. Also at the pool you could make free use of towels. In our case, unfortunately not hesitate to wipe them out, but only use it on one of the sun beds. You could use free on the tennis court and also received therefor balls and rackets. Also there was a good trampoline and table tennis. We were kindly received, but for the rest of the week we have not seen anyone from the reception"
"The name of this resort "The Oasis" is rightly chosen. When we were driving on highways through an industrial area we thought: You can not do it, but the resort itself you find yourself in a world apart: palm trees, swimming pools, tennis, everything is there. We were also guided by the owner. There&#39;s even our paella made on a wood fire. A beautiful house, where we were hospitably received. Our bungalow was unfortunately in the back on the road, which we sometimes hear, but that&#39;s not really our holiday beinvloed.Een Dutch TV channels (in another review) was not in our bungalow, which thus depends in from which bungalow you zit.We were within a half hour in eht center of Valencia, a beautiful city and within fifteen minutes at the airport. (But no planes flying overhead) is a must, this resort." 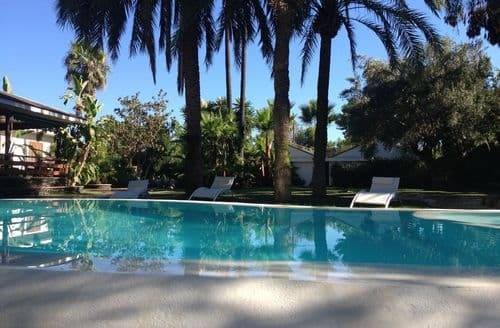 "Great accommodation, super friendly staff, top service (everything is controlled directly, even mobile internet because the wifi did not work in the cottage), tidy villa &#39;s fully equipped and fully furnished, large neat cozy garden with a hygienic and clean pool, short stay in Valencia actually could not go wrong. The owner of the complex, Mr. Jean-Paul Perez also showed a very friendly man, who was open for any tips. Valencia is a large but not a mass of frantic city \u200b\u200b(old and new part), which for everyone is a wide range of delicious restaurants, the best Paella, terraces, a fun nightlife, plenty of culture, an uncluttered beach but most of all, very relaxed people (especially noticeable in traffic). Due to all this, my sister, girlfriend and my parents had a great holiday." "We have enjoyed a few days of vacation in December in this house. The house is perfect for a family. It has everything that is needed. In our case we are a couple with 3 children aged from 3 years to 12, and the stay has been perfect. The first night we had some cold but we were solved the next day by leaving 2 more radiators to heat the house. The facilities are very good and certainly in summers can be used much more than in December, since it is not a question of bathing in the pools. The elastic bed and the play areas, enchanted the children. The friendliness of the staff and something that should be highlighted. All charming. A totally recommendable experience"
"We have just returned from a week at El Oasis. We have presumed lost in the 7th heaven: you open the doors of the kitchen is open and you have direct eye contact with the pool. All imaginable facilities were available: Dutch television, 4 bedrooms, 2 bathrooms, wireless internet, air conditioning, a beautiful pool, eem tennis court, sauna, Jacuzzi, and even a lemon and orange tree. The peaceful environment is the battery fully charged. Distance to City Centre Valencia is about 20 minuten.Warm welcome by Pierre and direckt dived into the pool. For breakfast, the temperature of the pool all voortreffelijk.Wij come back next year. Fam. Hanssen from Maastricht"